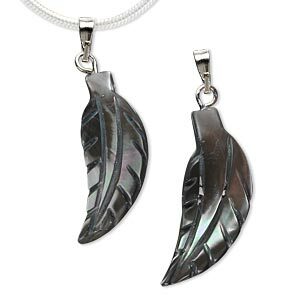 Pendant, trochus shell (coated) and imitation rhodium-finished brass, black, 26x9mm feather. Sold per pkg of 2. Beautiful carved shell pendants in well-matched pairs with removable bails for design versatility. 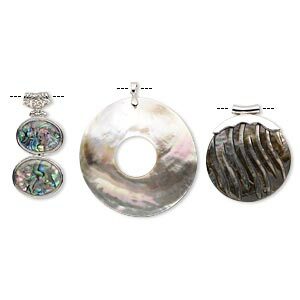 Use for earring designs by removing and reusing the bails or create pendant necklaces instantly. Sizes, shapes and colors may vary with handcrafted items. 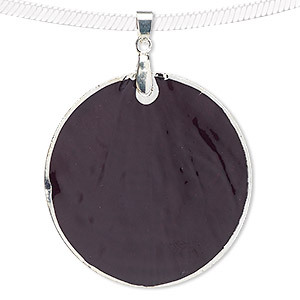 Pendant, Blue Moon Beads®, Capiz shell (dyed / coated) with silver-finished copper and "pewter" (zinc-based alloy), black, 49-50mm round. Sold per pkg of 2. Pendant mix, epoxy / multi-shell (natural / dyed / assembled) / imitation rhodium-finished brass, mixed colors, 26x25mm-70x70mm mixed shape. Sold per pkg of 3. 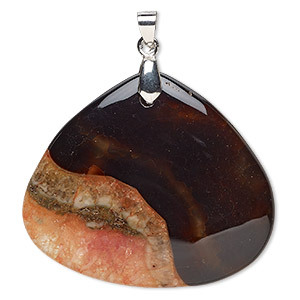 Pendant, red and black agate (dyed) and imitation rhodium-plated brass, 50x43mm teardrop. Sold individually. 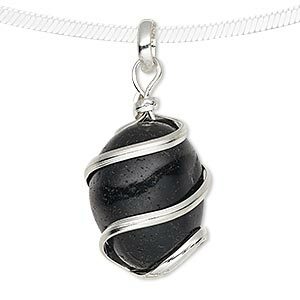 Pendant, black agate (dyed) and silver-plated copper, medium to large hand-cut wire-wrapped tumbled nugget. Sold individually. 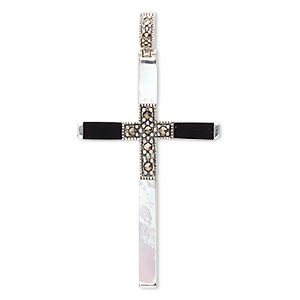 Pendant, sterling silver with marcasite / mother-of-pearl shell (natural) / black onyx (dyed), 40x25mm cross. Sold individually. 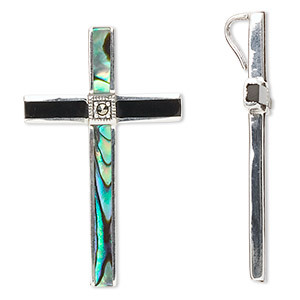 Pendant, sterling silver with marcasite / paua shell (natural) / black onyx (dyed), 39x24mm cross. Sold individually. 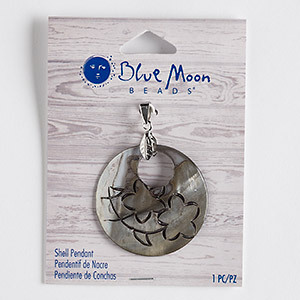 Pendant, Blue Moon Beads®, black lip shell (dyed) and silver-finished "pewter" (zinc-based alloy), black and grey, 39-40mm round go-go with carved flower and leaf design. Sold individually. 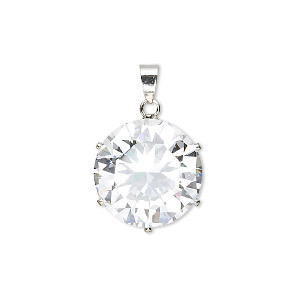 Pendant, cubic zirconia and imitation rhodium-plated brass, clear, 18mm faceted round. Sold individually. 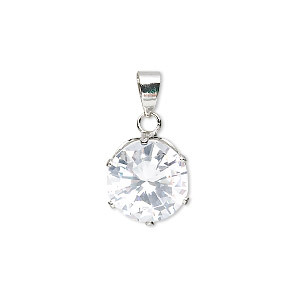 Pendant, cubic zirconia and imitation rhodium-plated brass, clear, 12mm faceted round. Sold individually. 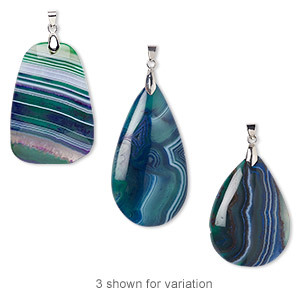 Pendant, agate (dyed) and imitation rhodium-plated brass, green and purple, 50x30mm-65x35mm hand-cut freeform teardrop. Sold individually.